Snrky: But we're losing $1,000,000 an hour until it's fixed. But we're losing $1,000,000 an hour until it's fixed. Blackmail! Makes for a funny Snarky, but it never works. At least not for long. Although .NET developers should have access to fun gadgets like the Kinect SDK (and a Kinect) to a.) make their brains go down different paths and stimulate non-traditional approaches to old patterns, b.) innovate (maybe that's just a. summarized), and c.) have some fun. While it could be argued that it detracts from time best spent on main line projects, you never know when just a small amount of time and resourcing that's kick started by a developer not having to provide personal funds results in your apps suddenly being available for someone who can't use traditional input devices (here's an example where someone hacked it to recognize ASL). Title: But we're losing $1,000,000 an hour until it's fixed. 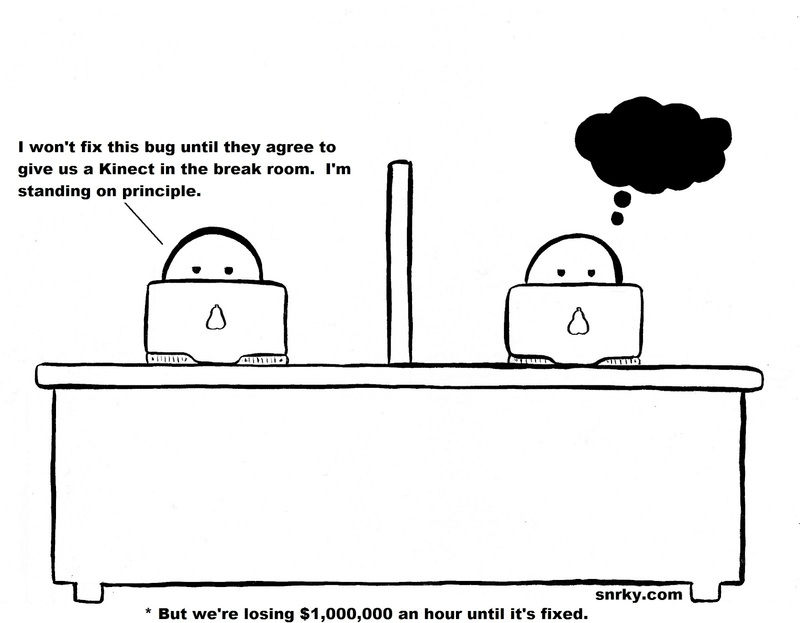 Snarky: I won't fix this bug until they agree to give us a Kinect in the break room. I'm standing on principle.